Perception | Rent-A-Friend 2000's Biblical Thinking and Good Times! Check them out on i-tunes. Be a Hamster. The Scene- Sean is wearing a red shirt and talking to his wife, True-Asia, and their friend Cook, AKA Cook Dawg, AKA the Drumma Beast Boy, AKA Saint Nick, AKA Captain Platypus of Space Patrol (Some of these nicknames might not be accurate). Sean: My shirt is RED. True-Asia: No, your shirt is black. Cook: You both be trippin! You shirt be green! Cook: Yes, of course. Excuse me. Your shirt is green. True-Asia: Spoken like a true gentleman. FACT: They each perceive the shirt differently. FACT: They DO each perceive the shirt. FACT: Perception requires something to perceive. If the shirt was not REAL, they would not all perceive it at all. THEREFORE: The shirt is REAL. The three independent perceptions prove it does exist, even though they disagree with some details. It is not an illusion or a hallucination, or what politicians refer to as “A Press Release,” or “The Polls” or “Statistics.” But I digress. FACT: The shirt actually exists. It is REAL. THEREFORE: If the shirt is RED, it is not black or green. If it is green, it is not black or red, etc. Again, Crayola has given you all the information on this that you will ever need, in convenient boxes of 64 (With a sharpener in the back!!!). Sean, True, and Cook CANNOT all be correct. At least two of them MUST be wrong. FACT: Light is necessary for us to see, but we do not need to see light for it to exist. In other words- Our perception allows us to be aware of light, it does not MAKE the light. The light exists OUTSIDE of our perception. THEREFORE: Reality (Of which light is one part) exists outside of and independent of our perceptions, knowledge and beliefs. FACT: Reality is independent of our perceptions, knowledge, and beliefs. FACT: Truth is word or thought accurately reflecting reality (describing what is REAL). THEREFORE: TRUTH exists independently of our perceptions, knowledge or beliefs. Because Sean’s shirt is REAL, then there are TRUE facts about it (Like what color it is) and FALSE statements concerning it (Like saying it is green when it is in fact RED). Because there is ONE reality (of which the shirt and all of us are a part) then the TRUTH about the shirt is TRUE for all of us, even if we do not perceive, know, or believe that truth. It is TRUE that Sean’s shirt is red, even if we do not see, know, or believe that it is, because the TRUTH is not determined by our perception, knowledge or belief, but by the real shirt (i.e. Reality). God made all that is. There is one REALITY. We perceive it accurately, and thus perceive TRUTH, or we perceive it wrong and perceive an illusion. We can know, think, or say something which accurately describes that reality, which would be TRUTH, or we can believe, think, or say something which does NOT accurately describe reality, which would be a lie. Anything TRUE is true for ALL PEOPLE because the truth does not depend on us, it depends on REALITY. Any truth is universal. If it is not universal, it is not TRUE. And as God is the creator of all reality, this is why it can be said that All Truth is God’s Truth. Oh, and everything that can be said, Metaphysically, about Sean’s shirt, can be said about rubber ducks. In case you wanted to connect this with my previous blogs. What do Pizza, Magic, and the Jedi have in common? You might say, “it depends on your perspective.” But actually, it doesn’t. That’s what they have in common. Let me explain: If you remember my map from a few blogs back, you’ll recall this: Perception- The five senses gathering information about reality through contact with it (eyes, ears, nose, skin, brain, etc.). In English class, we call this your “Point of View.” You’d know that if you weren’t so busy hiding your I-Phone in your textbook to download games. But this concept is discussed in more places than high school English. In Star Wars Episode I, Jedi Master Qui Gon Jinn says, “Your perception determines your reality.” I have no idea what he meant by this. I suspect George Lucas didn’t either. The Jedi spent the whole series saying inane things that made no sense, like at the end of Episode III when Obi Wan says, “Only a Sith deals in absolutes.” So, either he’s a Sith, or he meant to say, “From a certain point of view, it is frequently the Sith that deal in absolutes, which we as Jedi would personally hold to be in error, though we are reticent in passing judgment.” But then, we all just wanted them to get to the light saber fight. Your personal experience is determined by your perceptions. Apparently Qui Gon has used the word “Reality” when he should have said “Experience.” Jedi are a lot of things, but they are not sticklers for Metaphysical jargon. Reality has to exist BEFORE your perceptions, or you’d have nothing to perceive. It would be like saying, “Let’s eat, and then let’s go get some food.” You can try and argue that eating is your food, but you’re still gonna be pretty hungry when my stuffed-crust pizza shows up and I refuse to share. You can’t eat without food, and you can’t perceive a rubber duck without the rubber duck. Or can you? This is why the map branches off from Perspective into two possible paths: Truth or Illusion. What you PERCEIVE (See, hear, smell, etc) can be TRUE (accurately reflecting what is REAL) or it can be an ILLUSION (Different than reality). This is where your dirty, unemployed, -influenced cultists or left-winged college professors tend to try and argue. They’ll get all “No man! ALL Perceptions are true!” Now, before I explain why this is wrong, I want to point out the fact that they are ARGUING AGAINST SOMETHING. In order to disagree with me, they have to first decide that there is a difference between TRUTH and ILLUSION. They are arguing for the idea which they believe to be TRUTH, and saying that my definition is wrong- i.e. an illusion. Can you perceive something which is not real? To prove that you can, I present for you a little something I like to call: THE GLASS DOOR EXPERIENCE. It goes like this. You are walking toward what you perceive to be an open doorway. You do not see a door. You see an open passage way, and you believe with all of your heart that the doorway is open and clear of obstacles. Then, suddenly and without warning, you face-plant into the magical, invisible force-field of glass. As you pick yourself up off the ground, you come to discover that the door was there THE WHOLE TIME! 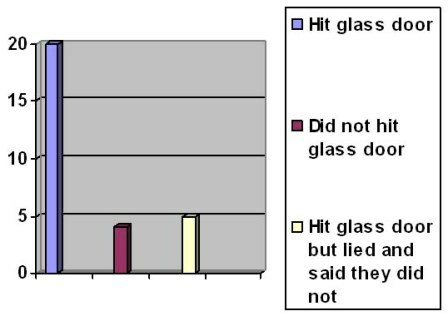 Your perceptions were WRONG! Leaving your pace print on a clean glass door is a universal part of being human. In a room of thirty people, it was rare to find more than five who had not had the Glass Door Experience. In other words, all of us have believed an Illusion and discovered the hard way that we had been wrong. Reality does not bend to our perception, our perceptions (And sometimes our noses) bend to reality. This is not always a bad thing. Consider magic shows. If you could not be tricked into perceiving something which was not so, it would be a pretty dull magic show. (“Here’s a hat with a rabbit inside of it. Now I will pull the rabbit out of the hat.”) And how could you pull off any decent pranks? (“Would you like a stick of gum that tastes like dirt?”) Plus, you’d never enjoy a movie. A movie is actually a series of still images played so fast that you cannot accurately perceive the fact that it is a series of still images. Your brain creates the illusion of movement because of its inability to perceive the individual frames. In some cases, illusions can be fun! Or painful! Why would anyone want perception to determine reality? Because it lets you play God. If God creates reality, and your perception creates your own reality, then you get to be your own God! This really only comes up in terms of morality. A man will cheat on his wife and then try and argue that, from his perspective, it’s not immoral. He’s trying to say, “If I perceive it as being acceptable, then in my reality it IS.” You won’t find these people using the same argument to get out of the laws of physics. A man who cheats on his wife will still demand a parachute if you try and toss him out of an airplane. Oh, you can suggest he simply choose to not perceive gravity, but they will just be crybabies about it. In summery, when you see something, you can see it as it really is (i.e. perceive truth) or you can see it differently than it really is (Illusion/special effects). You’re welcome to argue with me and stubbornly cling to the idea that your perception creates your own personal reality, but I’ll be laughing my way through a stuffed-crust pizza while you’re wiping your snot off of a glass door. Don’t worry, I’ll save you a piece. What are Rent-a-Friends for?